Hi all,These days i am taking little time to post new topics as i am doing little R&D in spring’s latest projects like ‘SpringBoot’ and ‘SpringData’. Now here is the post which will explain about ‘SpringData’. Please follow the code little carefully as i wrote block comments in order to better understand the logic. 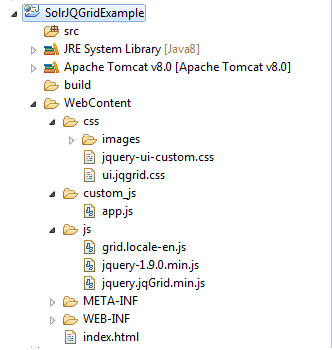 this project is designed under Maven,Spring4.1.1.RELEASE, Eclipse Luna and Tomcat 8.0.11. Please find the below is the project structure, First let us start with required dependencies for the project as shown below. application.properties this file is fully loaded with all properties which are required by major databases, just uncomment what ever you need and use it. # added configuration needed to use either MySQL and PostgreSQL. WebContextInit.java : This class is responsible for initializing the servlet(front controller) and remember this will only work with servlet 3 containers only. Now let us design our domain objects, data transfer objects and User defined Exceptions. In this case our domain object is “Person.java”. in this class we have a static inner class which is called “Builder”, the responsibility of Builder class is to create Person objects and return them. * An entity class which contains the information of a single person. * A Builder class that is used to create Person Object. * in create person and edit person forms. delete(T entity) which deletes the entity given as a parameter. findAll() which returns a list of entities. findOne(ID id) which returns the entity using the id given a parameter as a search criteria. save(T entity) which saves the entity given as a parameter. * which is stored in the database. Once we have our PersonRepository interface ready to use, let us start with service layer to hadle the business logic. PersonService.java : This interface is responsible for basic operations on the domain object in connection with the underlying database. * Declares methods used to obtain and modify person information. * Creates a new person. * @param created   The information of the created person. * @return  The created person. * @param personId  The id of the deleted person. * @return  The deleted person. * @throws PersonNotFoundException  if no person is found with the given id. * @return  A list of persons. * Finds person by id. * @param id    The id of the wanted person. * @return  The found person. If no person is found, this method returns null. * Updates the information of a person. * @param updated   The information of the updated person. * @return  The updated person. * @throws PersonNotFoundException  if no person is found with given id. The implmentation for the above service interface is as below. Note : all the methods of interface are implemented with default definition and only create has the exact logic, the others are left for you people to implement.Also observer @Transactional annotation it is at the method level not at the class level. Please observer that the PersonRepository class gets injected by the spring container and CRUD operation capability is provided by it. 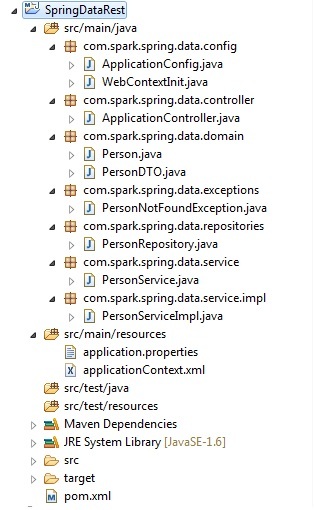 * the database by using a Spring Data JPA repository. Now every thing is completed from logic point of view let us start with the controller class class to handle different request from client. Please observe that i have hard coded the values from domain object here, in my next post i will be making this as dynamic, for time being this is for testing. Thats it guys we are done with coding part, now build the project get the war file and deploy it to server.If you see no errors in server console please issue below request from browser “http://localhost:8080/SpringData/rest/create&#8221;. in server you should see as below. and when you query database that should look as below. In my next post i will be integrating this project with AngularJs as my front end with fully Ajax driven application.